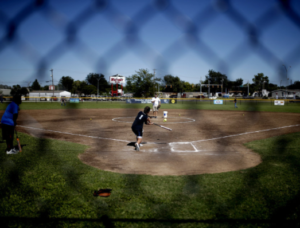 Fields & Futures took two big steps forward Tuesday in its quest to overhaul every athletic field in the Oklahoma City Public Schools. The organization announced not only a partnership with the Cal Ripken, Sr. Foundation but also a $1.5 million gift from Delaware Life. Both will aid in the construction on the remaining 22 athletic fields that Fields & Futures has committed to renovating. It has already overhauled 20 fields. The Ripken Foundation has built more than 60 youth development parks in 20 states over the past six years. Foundation President Steve Salem said it wants to provide safe places for kids where they can play, learn and grow. He sees a shared mission with Fields & Futures. “We … look forward to contributing however we can to help finish what Fields & Futures and Oklahoma City Public Schools have set in motion,” he said. In addition to Delaware Life’s gift, it pledged a seven-figure investment in a marketing plan that will target at-risk youth and advocate sport-related programs. That’s what Fields & Futures has been doing in Oklahoma City since 2012. It has seen grades improve and attendance increase at the seven schools where fields have already been built. But despite those good returns, Tuesday was a momentous day.